The quotes above truly echo the feelings of many fans about Doris Day through the years. For nine decades Doris Mary Ann Kappelhoff has been magic to millions of fans worldwide. We will never see another Doris Day. Miss Day is the total package: wonderful actress, one of the best singers ever, a great dancer, humanitarian and a wonderful classy lady. She is one of a kind. She could play a light comedic role to a heavy dramatic role and everything in between. Her singing ranged from the sublime to the unreal but it was always perfection. Here we pay homage to and celebrate our dear, sweet lady. She is an American icon. 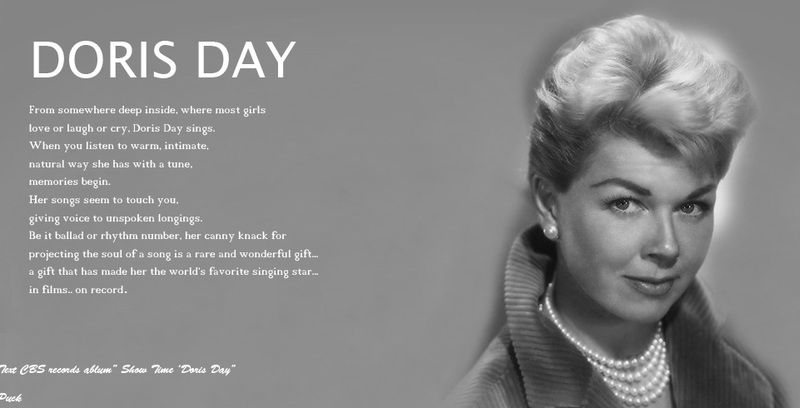 This is the first U.S. fan site devoted entirely to Miss Day. On these pages we explore the music, movies, television and animal advocacy careers of this wonderful lady. We also throw in a few other surprises for Miss Day's fans. So sit back and raise a toast to our beautiful lady! We hope you enjoy your visit and come back often. We often add more features such as a candid photo gallery, fashion shots, and so much more! And you know what Miss Day would really like her fans who love her to do? 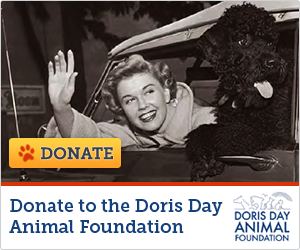 Please give a donation to the Doris Day Animal Foundation. Please help support Miss Day's mission to support the animals and the people that love them.